Keeping up with your favorite blogs can be somewhat of a chore. Robert Scoble talks about following over 700 feeds each day. But if you find that many feeds overwhelming, limiting yourself to a few blogs seems like the only option. Activeweave, however, has a solution. Instead of searching your feed for relevant content, their Blogrovr browser plugin serves you blog posts related to the content you’re viewing. SphereIt has a similar technology that embedded with posts, like on this blog. The plugin was spun off from an earlier project from Activeweave called Stickis. The posts are taken from your favorite blogs and populate a sidebar in your browser. Today they released a new version of the plugin with an improved algorithm, personalized suggestions, and Google reader integration. Blogrovr’s updated algorithm has significantly improved the quality and number of stories that show up. Their algorithm pulls in stories from blogs on my OPML feed and seems pretty on target. 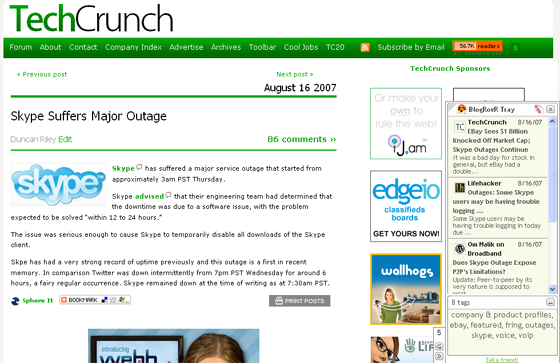 A look at one of the recent blog posts on the Skype outage shows how I get results related to Skype and the outage, even though there are not direct links between the stories. It’s not a destination like Techmeme for the tech blogosphere, but Blogrovr can scale to a large variety of blog topics. The new version also supports blog discovery by recommending new blog posts that are highly related to what you’re reading, even if they’re not on your feed list. The best feature enhancement has been the Google reader integration. Blogrovr now delivers blog posts related to what post you’re reading in Google reader, in real time. It’s still a bit slow in refreshing content, but a useful companion for Google reader.